I had a day out today visiting with my stitching friends. We had a very pleasant time showing off our recent finishes and sharing our work in progress. I took along the threads required for Just Nan’s Daffodil Run and I made a little start on it. 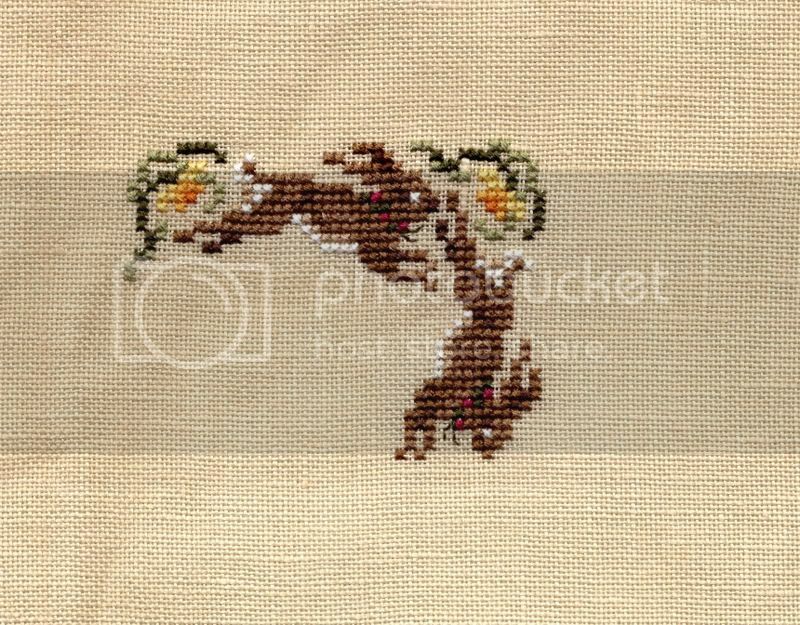 Here is my work so far (a clickable thumbnail) – I am planning to finish this piece as a little biscornu (and then stitch it again later using the charm – which is gorgeous). Later on this afternoon I went around to my sister’s place and caught up on her news – we haven’t seen each other in a week, which is strange for us (we live a five minute drive from each other). While I was there, my nephew Niall woke up and I had lots of fun playing with him he really is the sweetest child (yes, I am a very proud aunt). He can finally say “Cathy” rather than “car” (which was my first incarnation) or “caggy”(I’ve been Caggy for the last couple of months), which of course made his aunt very pleased. He will be two in July. There are a couple of adorable recent photos of him here (playing his drums) and here (riding in his bike trailer).